J. T. Farnham’s is an Essex institution that is often overshadowed by it’s down-the-street competition, Woodman’s. Both restaurants are considered fried clam royalty (Woodman’s actually claims to have invented the fried clam). In the spirit of full disclosure, one of us has a definite bias for Farnham’s over Woodman’s. This is because (a) this person truly like’s Farnham’s fried clams better, and (b) Farnham’s is the “little guy” in this fight. Woodman’s is the 800 lb gorilla of area seafood establishments. 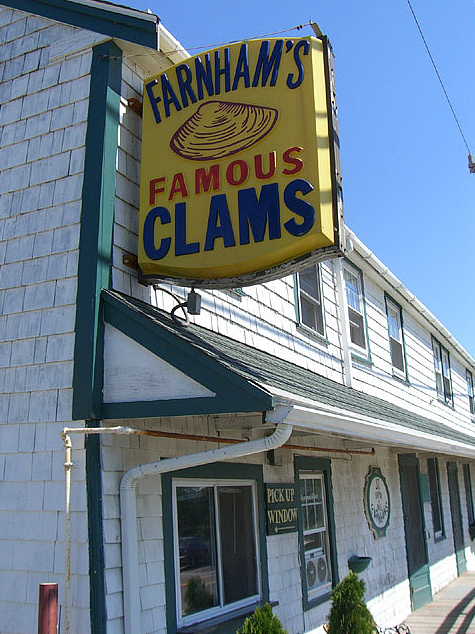 We can remember the original Farnham’s family hand battering their fried clams with care. At Woodman’s, it’s more of an assembly line. Although there’s nothing wrong with Woodman’s, there is definitely a feeling that supporting them is kind of like rooting for IBM or US Steel. Woodman’s is huge, diversified, and simply put doesn’t need our help or support. 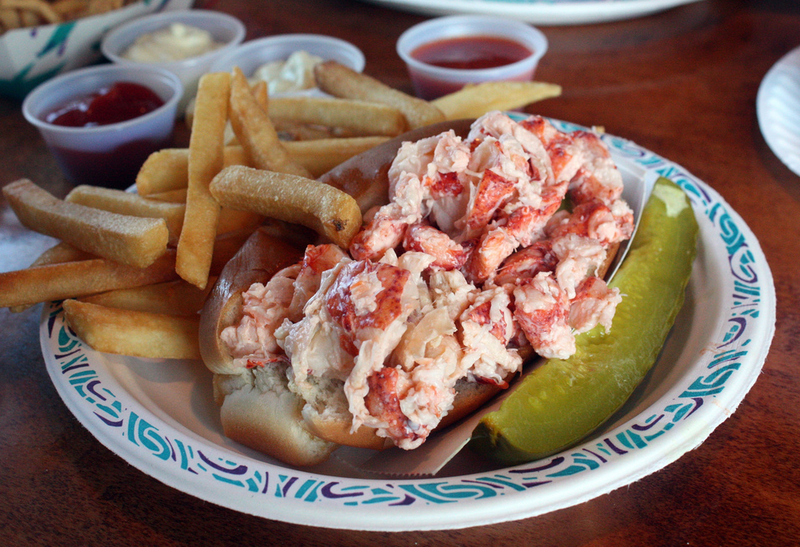 We’ve had Woodman’s lobster rolls, and they’re good, but that’s about it. So, for all these reasons, we chose not to include Woodman’s in our survey. Back to the Farnham’s lobster roll. We happened to be driving through Essex and made an unplanned stop. As is often the case, the place was hopping and we had to wait quite awhile for our order to arrive. This gave us plenty of time for us to eyeball the delicious fried clams on everyone’s table, and had us second-guessing our decision to go with their lobster roll. However, then the order arrived we were not disappointed. Farnham’s lobster roll was generously portioned, but contained much smaller chunks of lobster than we prefer. It wasn’t “lobster salad” by any stretch, but it didn’t feature the large chunks of lobster that we see from our favorite destinations. The lobster meat, which rested on a bed of shredded iceberg lettuce, was a bit wet, but not so much so that it was a problem. Standard split-top hot dog roll. J. T. Farnham’s can be found at 88 Eastern Avenue in Essex, MA. They don’t appear to have a website, but their Facebook page can be found here. PHONE: 978.768.6643. We borrowed this snap from Kathy YL Chan, and will be happy to remove the image upon request.